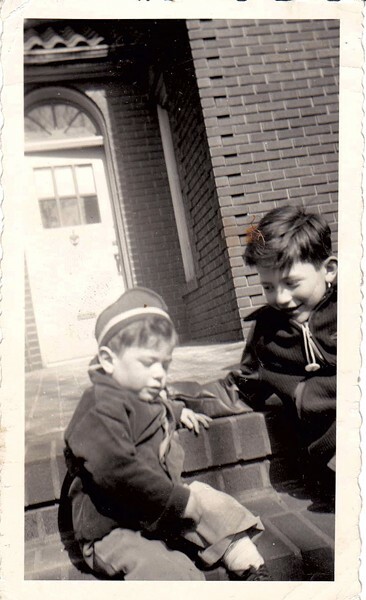 Bernie Sanders (left) and his older brother, Larry, on their street in Brooklyn. They grew up Jewish, but the family was not deeply religious, Larry Sanders said. The Republican candidates for president tend to talk about God. In smaller doses, so does Democratic frontrunner Hillary Clinton. Her chief rival for the Democratic nomination, Sen. Bernie Sanders (I-Vt.), rarely invokes God's name. The playbook that says that if you run for president, you pay public homage to a higher power? Sanders is not using it. If elected, Sanders would be the first Jewish president of the United States. That's a big deal that Sanders says little about. Yes, he speaks with pride about his Jewish heritage and how it motivated him to enter politics. But he isn't saying much about his personal beliefs or traditions. Is he a member of a synagogue? Does he believe in God? Sanders' campaign declined to answer these questions for Seven Days. "I'm proud to be Jewish," Sanders said last month at a Christian Science Monitor press breakfast. "But I'm not particularly religious." His brother, Larry Sanders, who lives in England, spoke in a telephone interview about growing up Jewish in New York City. The brothers were raised in a Brooklyn neighborhood where 80 to 90 percent of the neighbors were Jewish, he said. Their father sold paint; their mother took care of the family. Their parents were Jewish, but not deeply religious, Larry Sanders said, describing their approach as "basically secular," but with some religious observances. The family's friends tended to be the same. "There was only one out of a dozen friends, one family was what I would have called Orthodox," he said. "The others were pretty much like us." The family attended services at synagogue occasionally, such as on the High Holidays, Larry Sanders said. The brothers went to Hebrew school a few afternoons a week for several years to prepare for their bar mitzvahs, and completed the Jewish coming-of-age ceremony. The faith guided other rituals too, including Bernie Sanders' first marriage, shortly after he graduated from the University of Chicago. "His first marriage was not in a synagogue, but it was by a rabbi in a traditional Jewish wedding," said Larry Sanders. Bernie Sanders divorced shortly after the marriage and in 1988 married his current wife, Jane O'Meara Sanders. She grew up Roman Catholic about 15 blocks from her husband in Brooklyn. The couple exchanged vows in a civil ceremony at North Beach performed by then-Burlington city clerk James Rader, as several hundred friends, relatives and sunbathers looked on. Bernie Sanders had lived briefly on a kibbutz in Israel after college. This chapter may have contributed to internet rumors that Sanders has dual U.S.-Israeli citizenship. Last month, WAMU radio show host Diane Rehm, whose eponymous program is carried on National Public Radio stations, prefaced a question to Sanders on-air by stating he has dual citizenship with Israel. * Sanders interrupted, stating emphatically that he does not. "No. I'm an American citizen, period," he corrected her. In the aftermath, some pointed out that such rumors about Jewish politicians in America seem to question their patriotism or allegiance to the United States. The long history of anti-Semitism in the world had a direct effect on the Sanders family. Growing up Jewish in the aftermath of World War II and the Holocaust had a profound influence on the Sanders brothers, Larry Sanders said, echoing a sentiment that Bernie Sanders has made in public comments over the years. "You become very aware of the importance of politics," Larry Sanders said. "The political events in any country can end up causing the deaths of millions of people." The rise of Adolf Hitler led to the killing of 6 million Jews and took a brutal toll on the Sanders' extended family. Their father, then called Elias Sander — the "s" was added in this country to the surname, for reasons that are unclear, Larry Sanders says — emigrated from Poland in 1921. He was 17. "[Elias Sanders] and his brother came to the United States, and three [siblings] remained in Poland and of course they and their families all died," Larry Sanders said. "And an unknown number of cousins and whatnot." Larry and Bernie Sanders' mother, Dorothy Glassberg Sanders, was born in New York. A few years ago, Larry and Bernie Sanders made a trip to the village in southern Poland where their uncles had lived. It's called Slopnice. They found no descendants of the Sanders family, who were likely killed. According to the mayor, Larry Sanders said, Jews of the village and surrounding area were taken to a camp in a nearby town. They were held there and then executed, he was told. "They were killed in the marketplace, and there's no memorial," he said. Larry Sanders is a dual British and U.S. citizen who has degrees in law and social work, and has worked as an advocate for disability rights. In May he ran unsuccessfully for a seat in parliament as a Green Party candidate. He's watching his brother's run with excitement. "It's astonishing. It's marvelous," he said. The way Larry Sanders sees it, if his brother becomes the first Jewish president, the religious aspect would be a footnote, and not a terribly big milestone. Others are pondering the question, too. How important would it be to have a Jewish president? "It would be more important to have a president who cared about poor people. He happens to be both," said Joshua Chasan, senior rabbi at Ohavi Zedek synagogue in Burlington. "I feel very close to Bernie as a Jew because we come from the same place — a secular Jewish background, rooted in an early childhood experience of coming to grips with what happened at the Holocaust. He has spoken at the synagogue on a Saturday morning, and he described how that was a searing experience for him." Chasan said he respects Sanders for keeping his religious views low-key during the campaign. "Thank God. Anybody who's wearing their religion on their sleeve, be careful. Be careful. There's too much of that in American politics. Bernie doesn't wear his religion on his sleeve. Bernie is who he is and has been all these years, and for that I'm grateful." Granted, Chasan does not overlook the history of religious discrimination and how it plays out in politics, noting that there wasn't a Roman Catholic president until John F. Kennedy was elected in 1960. Most U.S. presidents have been Protestants, with nearly half members of the Episcopalian and Presbyterian denominations, according to analysis by the Pew Research Center. Vermont son Calvin Coolidge was the only Congregational president. Historians debate whether two of the most famous presidents should be described as Christians: Thomas Jefferson, who was raised as an Anglican but stated he did not recognize Jesus Christ as the son of God; and Abraham Lincoln, who was not affiliated with a church but spoke frequently about God. Ultimately, Chasan said, "The issue is not the religion of the candidates, it's the content of their character." That sentiment might resonate in Vermont, which has one of the nation's highest percentages of secular adults. Thirty-seven percent of Vermont residents are unaffiliated, compared to 23 percent nationally, according to the Pew Center's Religious Landscape Study. The survey of 35,000 people in 50 states found that about 70 percent of U.S. residents identify as Christians (compared to 54 percent in Vermont) and 1.9 percent identify as Jewish (2 percent in Vermont). In certain parts of the country, candidates can expect to encounter huge crowds at prayer breakfasts, churches and faith-based events where voters scrutinize a candidate's religious views and background. Hillary Clinton has written and spoken about her Methodist faith, and while she is less overtly religious than many Republican leaders, she reaches out to the faithful with speeches and appearances. "It's in the south, primarily, where you find voters for whom religious concerns matter more," said Eric Davis, professor emeritus of political science at Middlebury College. As Sanders transitions from campaigning Vermont-style to the national arena, these differences could be a consideration. Davis is among the Bernie-watchers who have noticed the senator's recent mentions of Pope Francis. The pope's calls for action on climate change and income inequality align with Sanders' views. Could the call-outs to the pope be an effort to reach out to religious voters? Perhaps. Or perhaps Sanders simply wants to point out that aspects of his platform have support from the leader of a worldwide religion, Davis said. "He's the pope, who is a recognized world leader, who is talking about these important public policy issues in a moral context." If Sanders doesn't win the Democratic nomination, it's not going to be "because of his religious practices or lack thereof," said Davis. More than reaching out to religious voters, Sanders needs to make his message resonate with the racially diverse electorate in the United States, Davis said. Hillary Clinton has a commanding lead over Sanders among Hispanics, for example, he noted. And reporters are noticing that Bernie's crowds "are overwhelmingly white, and they don't look like the country as a whole in that regard," Davis said. Immigration, criminal justice and civil rights are issues that Sanders needs to talk about in a new way for an electorate that is much more diverse than Vermont's, Davis said. And if Sanders doesn't want to talk about his personal views on religion, that's fine by Davis. If he were running for president, Davis would have an answer ready for any reporter who asked about his worship practices, he said: "I would say: 'That's none of your business.'" *Correction, April 6, 2016: A previous version of this story misspelled Diane Rehm's name.